Have you ever stood by a Roulette table at a casino and watched players stack chips on the same bet with complete calmness, even after losing several bets in a row and watching their bankroll dwindle from mountains of chips into almost nothing? Most Roulette players would sweat profusely at an endless string of losses. But some players - the cool and collected ones - don't seem to mind. There's one of two things going on here. Either they're very rich. Or they subscribe to a Roulette betting system. Have you heard of them? Roulette betting systems are strategies that Roulette players use to make money. It's not necessarily about where you place your bet. It's about how you bet. There are tons of different strategies, but today we're going to walk you through four of the best ones. So read on before you place any more bets at the online Roulette wheel. When new Roulette players step up to the wheel and try to use a system for the first time, there's a good chance they're employing the Martingale System. It's one of the easiest ones to grasp, which is why so many players use it. Here's how it works. Every time you lose a bet at the Roulette wheel, you double your wager for the next bet. That's really all there is to it. For example, start with a $5 bet. If you lose it, bet $10 on your next bet. Lose that one and you'll need to bet $20. Lose that bet? You'll need to drop $40 down. Lost again? No worries, just drop $80 on the table. We know what you're thinking. You just dropped $155 on the table and you've got nothing to show for it. But here's the thing. On your next bet you'll need to drop $160. And if you win that bet on a wager that pays 1:1, you'll win $160. Take into account your $155 in losses and you're now up $5. The system, invented by Paul Levy in 1934 and developed later on by Joseph Leo Doob, is based on the idea that chances of hitting a ridiculous number of losses in a row is pretty slim, especially if you keep betting on the same colour or on evens and odds. So does it work? Lots of Roulette players swear by it. But if you hit a string of losses, recouping could take a lot longer than you'd expect. And here's the other thing. In real land-based casinos, you could hit a Roulette wheel with a $200 or $500 maximum. If you reach the table max and you haven't hit a win, you won't be able to double your money anymore, and that'll set you back even further. The whole idea of the Martingale System is that you'll be able to recoup your losses. But losing isn't fun, and the problem with hitting the maximum bet and not being able to double your losses presents a problem. That's why the Anti-Martingale System was invented. Instead of doubling bets on all losses in an effort to gain back what you've lost, the Anti-Martingale System requires the player to double their bets on wins and lower them on losses. The goal of this system is to take advantage of hot streaks as opposed to trying to build up a bankroll that's fallen low. The Martingale System is pretty straightforward. You don't need a math degree to figure that one out. The Laboucher System, however, requires a bit more concentration. You'll need a pad and paper for this one. If you're playing at an online casino, you can use the text editor or notepad on your PC or Mac. If you're playing Roulette at a real casino, just ask the pit boss for a pen and paper. They'll gladly provide you with one. If you don't know what you are doing, roulette can be a quick way to lose your bankroll. Don't panic, because we've got you covered. Our strategy guide will walk you through the game of roulette, helping you to avoid the major pitfalls that trap the uninitiated. And start right by getting our roulette odds chart. Get a larger version by clicking the image and keep it with you when you play. Now that you know what tools you need for this one, let's run through the basics. First, you'll need to select 5 consecutive numbers. These numbers have nothing to do with the numbers on the Roulette board. You're simply concerned with values that you want to bet. Let's use the numbers 1+2+3+4+5 for this example. Each number in the example is a unit of betting (the value of a chip). And the total of the five numbers is the amount of money you'd like to win. To arrive at your bet amount for every spin, just add the first and last number in your sequence. But those numbers won't stay static for very long. Each time you win a bet, you'll want to cross the first and last number off the list. If you lose a bet, you need to write down the number you just lost at the end of the sequence. Using our example of 1+2+3+4+5, you'll wager $6 on your first bet (that's 1+5). If you lose, go ahead and add the 6 to the end of the sequence. You should now have 1+2+3+4+5+6. Your new bet? That would be $7 (1+6). Did you win? Go ahead and cross off the 1 and the 6 off your list. Your next bet $7 again. The advantage of the Laboucher System is that you won't hit the house maximum as fast as you would with the Martingale System. But after just a few losses, you'll see your sequence of numbers get bigger and the potential to lose more money will increase. Take a look at the Roulette board when you have a chance. There's something special about the third column. Do you see it? There's only four black numbers on the board. The rest? Red. And eight of them. That's way different than what you see in the middle column (eight black and four red) or in the first column (six red, six black). The Red System of Roulette betting stakes advantage of the last column. With The Red System, you place a $5 bet on the third column and a $10 bet on black. Notwithstanding hitting single or double zeroes, here are your four possible outcomes. You hit a red number in Column 3. This gives you a $10 win for your $5 column bet, but a $10 loss on your black bet. You just broke even. You hit a black number in Column 3. This gives you a $10 win for your $5 column bet and a $10 win for your black bet. That's a $20 win. You hit a red number in Column 2 or Column 3. You don't win anything. In fact, you lose $15. You hit a black number in Column 2 or Column 3. You lose your $5 column bet, but you end up winning $10 on your black bet. You're now up $5. With this betting system, the only outcomes that will put you in the hole are hitting red in Column 2 or Column 3, or hitting zero or double zero. Every other bet will leave you with a win or breaking even. Unfortunately, the whole idea of breaking even means that the Red System leaves you waiting forever to see any type of big gain, particularly if you keep hitting a break-even bet. We only covered four different Roulette betting systems - and believe us, there are tons more. The mere fact that some of these Roulette betting systems contradict one another means that some systems work better for some people than others. Remember, Roulette is all about getting lucky. There's really no fool proof method to winning at online Roulette or the live version. But just as some casino players get lucky with every spin, others find luck in betting systems. Our advice? 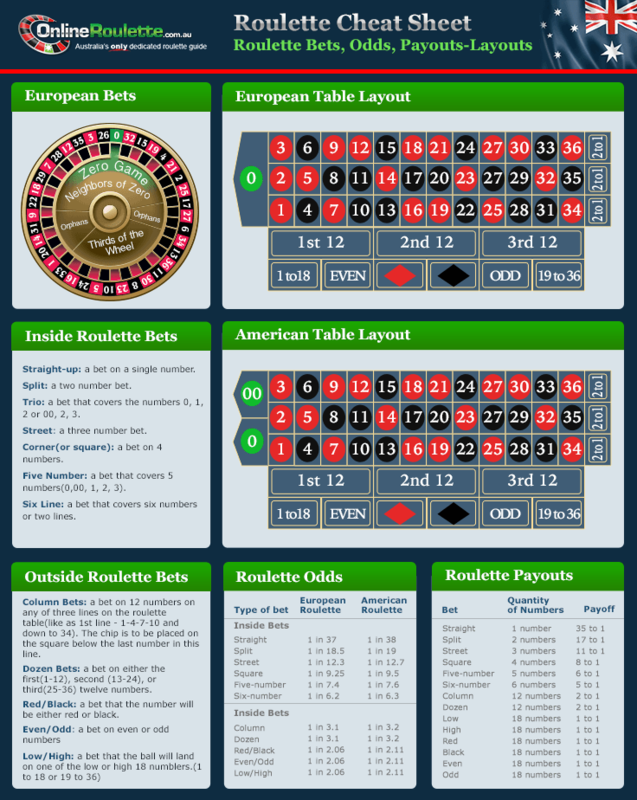 Try a Roulette betting system out for free by playing at Roulette casinos that offer play-money versions of their games. You'll be able to see if a specific betting system has any value without losing any of your own money. Yes…and no. They don't guarantee any sort of result, but can often be a better option than aimlessly placing bets around the table. While it's not guaranteed success, enough people used them to their advantage to make them notable enough to be mentioned on sites like this one! Also keep in mind that if they worked all the time, everyone would use them (and casinos would probably drop the game). Especially if you are new to the game, a betting system can be a great way to help make your money last (and potentially multiply) without aimlessly throwing your money on the table and hoping for a big hit. However, it might be a smart choice to avoid picking one of "the go big or go home" strategies (such as the Martingale) that increase your bet size extremely quickly. Are they proven to work in the long-term? Nope. While systems might give you slightly better chances of winning versus someone betting sporadically, the odds on each spin are still the same and roulette will always be a game of chance. If I don't use a system, am I wasting my time? Not necessarily, as there is no guarantee either way with these systems. While they don't necessarily increase your turn-by-turn odds of winning, many players have had success using these systems. Just remember that gambling is a form of entertainment like anything else. If you are playing responsibly and having fun, then you shouldn't consider it a waste of money! Do I have to bet a certain amount of money? It depends on the system. Some, like the Martingale system, require you to double your bet with each spin. Others, like the Red System, recommend doing smaller increases as you play more and more. Many of these systems are, meaning you can modify them to be friendly to your own personal betting limits. Also keep in mind that many tables have betting minimums that you must comply with, regardless of if you are a system better or not. Are online casinos aware of these being used? Will I get banned? Not to be confused with card counting, roulette systems are fine to openly use because there is no "perfect" system that guarantees wins. Some casinos may even provide you with pen and paper to help you keep track of your bets and follow your system!